TechPowerUp writes Zalman's CNPS2X ultra-compact processor cooler will hit the market by late July for around $30. 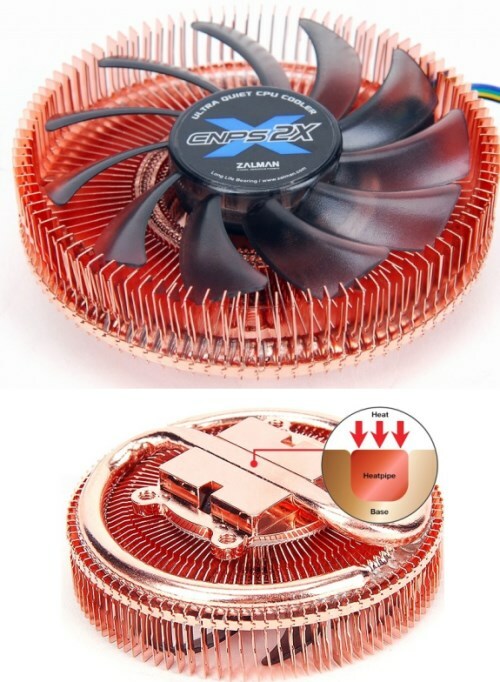 The heatsink features a mirror-like copper base with a single 8mm diameter direct-touch heatpipe and a spiral-shaped copper heatsink that's cooled by a 80mm PWM fan. This heat pipe twists out into a spiral shape, and along its two arms, a spirally-projecting copper fin array draws heat. This array further compresses down at the base. An 80 mm PWM-controlled fan is nestled inside the fin array, its downward and sideways airflow ventilates the fins. Measuring 84 x 84 x 27 mm, the CNPS2X weighs 83 g. Zalman claims the cooler can handle thermal loads of up to 120W. Most modern CPU socket types are supported, including LGA115x, AM3+/AM3, and FM2/FM1.